The Adventure of Sherlock Holmes’ Smarter Brother. 20th Century Fox 1975. This movie is incidentally legendary in my family. I’m told I saw a few minutes of it at an extremely young age until my mother realized she shouldn’t be playing it in the presence of someone so young. So this is the Ur-example of movies I haven’t seen because of good parenting. 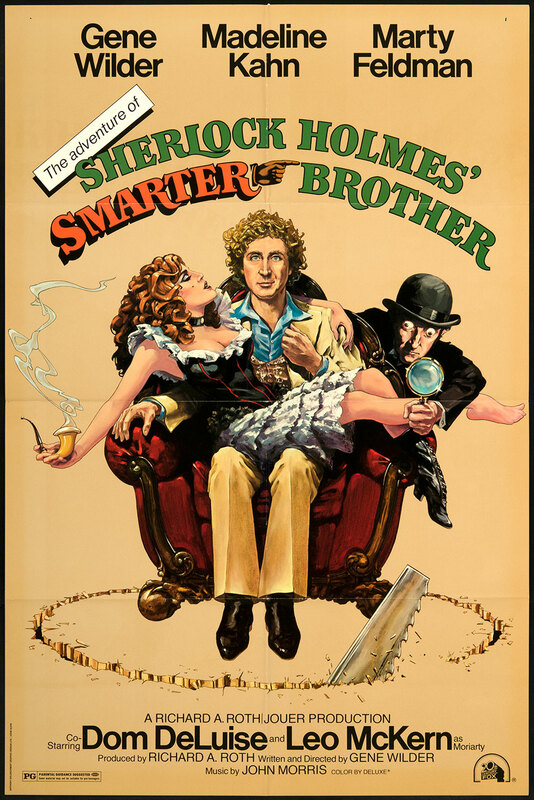 The combination of Gene Wilder and the Holmes mythos is an odd one, but both of them individually are reasons to take an interest, so hopefully they merge successfully. I expect the reason Wilder’s character is “Sigerson Holmes” when Mycroft Holmes is a canonical character who is actually smarter than Sherlock is so they have more room to do what they want with him, but I hope Mycroft at least gets a mention. I think the Doyle estate still had American copyright over Holmes characters, so this might be a legal loophole as well. I think somewhere around the house there’s still an off-air recording of this movie (which has most of the title on the label, but always seemed less like a title and more like a placeholding description), but even if we had a working Betamax player, I don’t like to review from off-air recordings since scenes get cut for time and content, and commercials break the flow in an unintended way. I saw this float through the library again and decided it was time. When Sherlock Holmes finds the nature of a blackmailed singer’s case ill-suited to himself, he passes it off to his frustrated, overshadowed, never-bef0re-mentioned brother Sigerson. The case is complicated because Jenny, the singer, is nearly incapable of trusting anyone, and so lies constantly, but her blackmailer is in the employ of Professor Moriarty, her life is in danger, and one of Britain’s most important secret documents are at stake. The film immediately tells us where it stands with Holmes lore. “You never told me you had a brother Sigerson.” “I never told you I had a brother Mycroft… until the occasion arose.” Sherlock explains the situation and then disappears, allowing his brother to have his own limelight for once. Many of the references Wilder directly made beside that and Sigerson’s name went over my head (Sigerson’s assistant is named after an early draft’s name for Watson, for example; that’s deep trivia), but some elements of the case reminded me of Holmes cases in ways that I’m not sure were meant. Jenny being blackmailed over an indiscreet letter reminded me of Irene Adler, and breaking into the blackmailer’s home to steal papers back reminded me of Charles Augustus Milverton, but these could be incidental to the blackmail element. As is the lot of a comic hero, Sigerson’s informed brilliance is undermined for the joke more often than not. Usually, it’s through him fatally overcomplicating a problem, which leads to some of the best moments, but sometimes he’s just overridden by Wilder’s usual naive ineptitude shtick, and this leads to the more mediocre jokes. The best comedy comes from Leo McKern’s neurotic Professor Moriarty, and Dom DeLuise’s barely-in-the-movie blackmailing opera star. The two come close to stealing the show when separate, and their scene together runs away with it entirely. Most summaries take Sherlock’s declaration that he’s leaving the country at face value, but it becomes clear fairly quickly this is only a ruse, and he’s keeping watch over Sigerson’s handling of the case, prodding him along sometimes. Sigerson never appears to see through this until the end, and even afterward doesn’t appear to recognize the only disguise I picked up on immediately. There’s a lot to Sherlock’s gambit that I only saw after a lot of thinking about the plot, which I won’t go into because probably even just mentioning it is too far. This movie might take a while to warm up, but it’s a lot of fun and works on a deeper level than most fun movies do.